Money used to represent a medium of exchange that would facilitate bartering. Instead of exchanging goods or services, people would receive a piece of paper that was equal to the value of their goods or services. This was initially an honest system when for each service or goods offered there was only one bank note issued. Eventually the banker started to cheat and issued a lot more money/paper than the counter value produced in kind. And that was the beginning of money printing. It just became too tempting and convenient for governments and bankers to simply create more money since nobody would really know. So if the value of a day’s work or a pig were both say $100, the money or paper issued for this should be $100 for each. But gradually governments/banks would issue more and more paper with nothing produced in return. All banks today lend at least 10x the money deposited so for every $100 received $1,000 is leant. But the leverage can be much greater like Deutsche Bank which is leveraged nearer 50x. The effect of this money creation is that the $100 pig will eventually cost 50x more or $5,000 for the same pig. The pig hasn’t gone up in price since there is no scarcity of pigs but the money has instead gone down in value to 1/50th. The same for a day of labour. The man who previously received $100 per day now gets $5,000 for his work. He is not working harder and the price of labour has not gone up in real terms. But the value of money has gone so he needs to work one day to buy a big which now costs $5,000. I do realise it is a very simplified explanation but in essence, it is the way the corrupt monetary system works. And this is how governments destroy the value of money. As they mismanage the economy and can’t make ends meet, they just issue more paper which has zero real value since it just lowers the purchasing power of money. The value of paper money has been totally decimated in the last 100 years since the creation of the Fed in 1913. 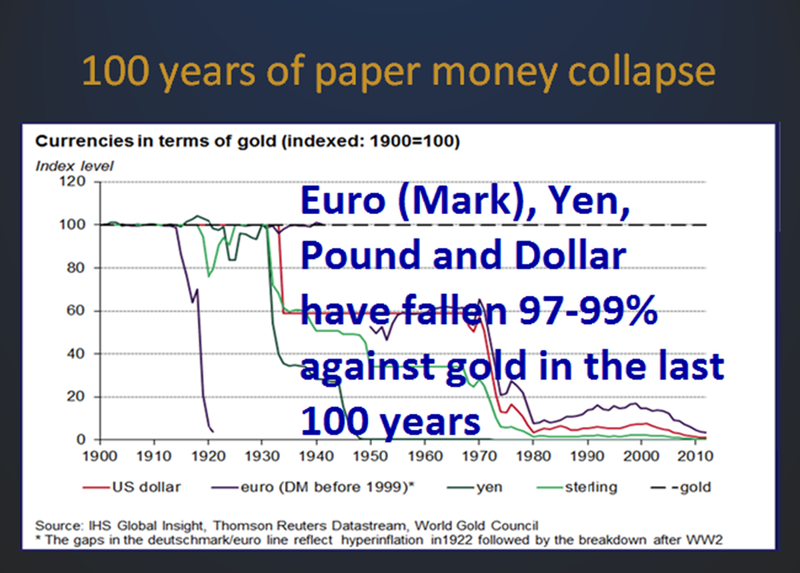 The chart shows how paper money has declined in relation to “real money” which is gold. All major currencies have declined 97-99% against gold during this period. So there is only 1-3% to go until they reach ZERO. But from here to zero is another 100% fall which will be disastrous for the world and involve an economic collapse as well as hyperinflation. 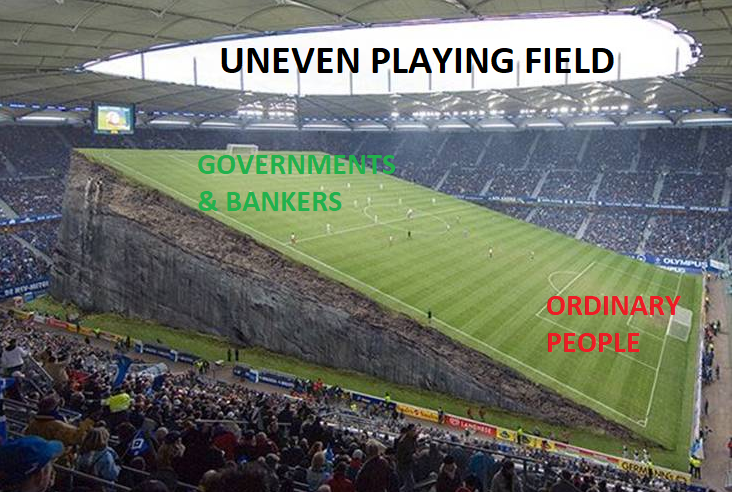 The problem with money printing is not just that it destroys the value of paper money, as creating money out of thin air also creates a totally uneven playing field. To produce goods or services requires a lot of hard labour for ordinary people. But governments and bankers have the upper hand because they just need some electricity which allows them to press a button to produce money. And this money that they produce has the same value that ordinary people struggle to earn. We are now not far from the point when the bubbles in stocks, credit and property will collapse. This will lead to a final futile attempt by governments to save the world by printing unlimited amounts of money. At that point, normal people will finally realise that the money they are holding is totally worthless. This will lead to protests, attack on government and bankers as well as social unrest. In spite of a small move in the last few days, many holders of precious metals are getting restless. This is totally normal since we have seen a 6 year range of $150 above or below the June $1,220 bottom. I often get the question if the paper gold manipulation will go on forever as seems to be the case since 2013. My very firm belief is that we are likely to see the end of this consolidation period right now. During the autumn of 2017, gold is likely to resume its uptrend to eventually much higher levels. That next strong uptrend in gold will also eventually break the paper gold market. The reasons for the coming move are manifold. The risk situation in the world are more critical than ever both economically and geopolitically as I have outlined many times in my articles. Also, the supply situation physical gold is very tight. All the mine production of 3,000 tonnes are easily absorbed and no more can be produced. 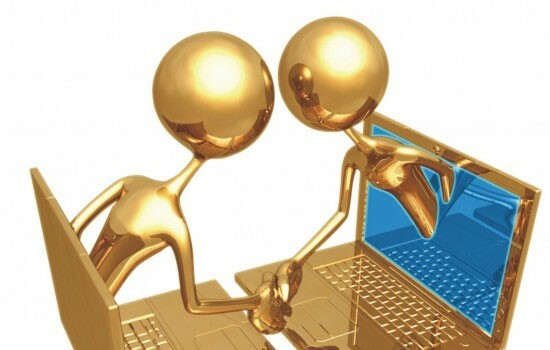 In my recent audio interview with King World News I explain this in detail and that we have never seen sellers of physical gold in quantity and that bigger wealth preservation buyers are now buying again. We are likely to see many surprises in the coming months. Tagged bang lending, currency debasement, paper money, paper money collapse.